Perched on the peaks of towering sandstone pillars formed millions of years ago stand the monasteries of Meteora, most of which were constructed during the Middle Ages. The Greek word meteora means “suspended in the air,” and this phrase aptly describes these remarkable Greek Orthodox monasteries. As one of the most spectacular sights in Greece, the Meteora monasteries not only offer incredible views of the surrounding landscape but a unique perspective of medieval monastic life as well. Six of the original complexes are still inhabited by clergy who welcome visitors from all over the globe. The picturesque town of Kalabaka situated at the foot of the peaks serves as a comfortable base camp for treks to the top. The relatively small Holy Monastery of St. Nicholas Anapausas is often overlooked during tours of the monasteries, but the easily accessible complex is definitely worth a visit. The 14th-century monastery boasts some of the finest frescoes in Meteora. The famed Cretan painter Theophanis Strelitzas adorned the main chapel with lively illustrations of Biblical scenes as well as depictions of 16th-century monastic life. The road from Kastraki takes visitors to the base of the peak where 150 steps lead to the monastery entrance. Lower in elevation than the other six major monasteries in Meteora, the Holy Monastery of Rousanou is one of the easiest to access, and a newly restored bridge makes the trek over its sheer cliff walls considerably less frightening too. Founded in the 16th century, the monastery became a nunnery in 1988. The friendly nuns who greet visitors at the door stand in stark contrast to the gruesome scenes of martyrdom depicted in the main chapel’s well-preserved frescoes. The pretty courtyards and gardens outside are much more cheerful, and they provide the perfect backdrop for picture-taking. The only monastery in Meteora visible from Kalambaka, the Holy Monastery of St. Stephen has been a place of pilgrimage since the 14th century when Byzantine emperor Andronicus Paleologos visited and subsequently funded the original church. Built in the 1500s, the present church features the skull of St. Charalambos, which is believed to have miraculous healing powers. The monastery suffered much damage in the 20th century: it was bombed in World War II by the Germans while most of the frescoes were defaced by Communist rebels during the Greek Civil War. St. Stephen’s was virtually abandoned until 1961, when it became a nunnery. The 15th-century refectory has been converted into a museum that displays finely embroidered robes and tapestries. The monastery is easily reached by a bridge from the main road. The nuns welcome visitors and sometimes offer their handmade embroideries for sale. The second largest of the Meteora monasteries, the Holy Monastery of Varlaam offers a glimpse of the difficulties the monks encountered when building their hilltop sanctuaries. It took 22 years to bring all the building materials to the summit. The tower, receiving platform and rope basket used to hoist the supplies are on display in the refectory museum. Until the 20th century, the only way for visitors to reach Varlaam was to be hoisted up as well. Today, 195 steps carved into the stone cliff face lead visitors to the summit. Inside, frescoes cover the walls of the main chapel, including a harrowing depiction of the Apocalypse. The oldest and largest of the Meteora monasteries, the Holy Monastery of Great Meteoron is the highest too, rising more than 615 meters (2,000 feet) above the valley floor. Founded by St. Athanasios, whose disciples included exiled royalty, Great Meteoron has long been considered the most prestigious of the monasteries as well. Visitors who climb the more than 300 steps to the apex gain access to a grand complex that includes a large 14th-century church, a small museum, a wine cellar and a shaded courtyard. For many visitors, the most memorable display is at the sacristy where the skulls of the monastery’s former occupants are lined up neatly on shelves. 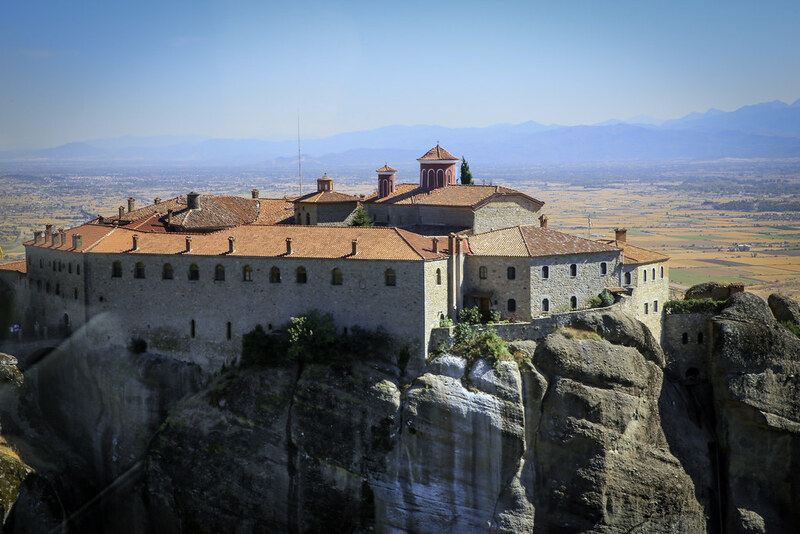 Featured as a setting in the 1981 James Bond thriller “For Your Eyes Only,” the Holy Trinity Monastery is perhaps the most recognizable of the Meteora monasteries. Situated atop a lone rocky pinnacle, it’s also one of the most challenging monasteries to reach. From the parking area, visitors first descend 140 steps down a steep ravine, and then climb another 140 steps up to the compound. Most visitors find the hike well worth the effort. With its domed chambers, fully restored 17th-century frescoes and picture-perfect vistas, the Holy Trinity Monastery rewards visitors with an experience that won’t be soon forgotten.